Make friends and influence people with these sensational halloumi fries – deep-fried strips of halloumi with a crispy, earthy nigella seed batter. Dip in bright, lemony garlic mayonnaise for inappropriate levels of cheesy enjoyment. Serve the hot, nutty fries fresh-out-of-the-oil, dipped in luscious garlic mayonnaise with squeezes of lemon juice. Looking for more delicious halloumi dishes? 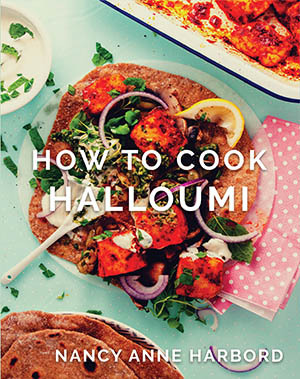 This recipe is taken from How to Cook Halloumi – vegetarian feasts for every occasion by Nancy Anne Harbord – available in colour hardback and e-book. A dazzling array of super colourful, incredibly tasty halloumi recipes for brunch, dinner and parties! 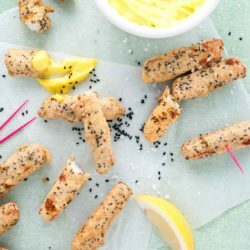 Halloumi fries with a crispy nigella seed batter – dip in homemade garlic mayonnaise for sensational vegetarian party snacks! Juice the lemon, add the garlic to the lemon juice and set aside for 20 minutes – this effectively cooks the garlic. When the garlic is ready, add to a food processor with the egg yolks and a pinch of flaky salt. Whiz for a few seconds then start adding the oil – drip in one tiny drop at a time until the yolks have absorbed about a third of the oil and the mayonnaise has started to emulsify. Add the oil any quicker and the mayonnaise might split. Taste to check the seasoning, adding more lemon juice or salt as needed. Loosen with 1-2 tablespoons water if the mayonnaise is too thick. Whisk together the flours, nigella seeds, ½ teaspoon flaky salt and 140g cold water – the batter should have the consistency of double cream. Heat the oil in a large pan to 170°C – when the oil it at the correct temperature a cube of bread will brown in 60 seconds. Coat a piece of halloumi in the batter and drip off any excess. Slide into the oil and repeat with about 8 more fries – any more and the oil temperature will drop too much. Fry for about 5 minutes, until lightly browned and very crispy. Drain on paper towels and keep hot while you finish frying the rest of the cheese. 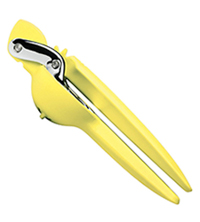 Serve immediately dipped in luscious garlic mayonnaise with squeezes of lemon juice to cut the richness.